TripAdvisor "Certificate of Excellence" and "BRAVO Award" winner. Top Rated Hotel in Masinagudi. Well wooded forests of Mudumalai is a home to many an insect species. Every season offers these insects many varieties of dead decaying cellulose matter as food. Old tree trunks are the ideal nesting sites for lots of these insects. As you start walking in the jungle pathways you get to see all these interesting beetles, bugs and moths, dragonflies and many more of these beautiful little creatures that inhabit our beautiful surroundings. This healthy population of the insects is also one of the reasons behind such a diverse avifauna in this dry deciduous forest. Every morning there are many birds chirping and flying around the open grassland and hopping around and picking insects. Amongst all the insectivorous birds, there are woodpeckers ranking on top in diversity and frequency. It is amazing to listen to knocking sound made by these beautiful pint sized birds called woodpeckers. Some of them are busy in carving their homes in dead tree trunks. Some of them are trying hard to catch termites and wood borers. Every species of woodpecker has their own preference, when it comes to feeding grounds. Small woodpeckers like Heart-spotted Woodpecker (Hemicircus canente) which are 16cm in size prefer to feed on termites from damp tree trunks. Rufus woodpeckers (Celeus branchyurus) can be seen wandering around bread leafy areas and catching insects from thin dry tree branches. 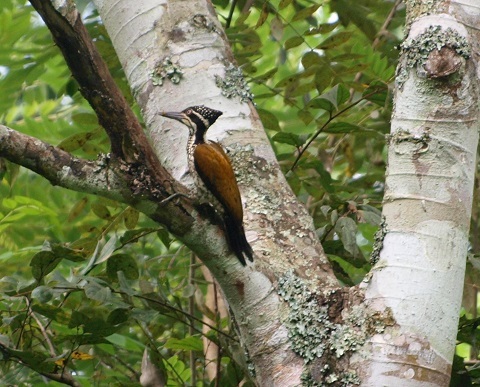 Black-rumped Flameback (Dinopium benghalense), Greater Flameback ( Chrysocolaptes lucidus) and Streak-throated Woodpecker (Picus xanthopygaeus) roams around coffee plantations, well wooded areas covered with silver oaks and sometimes on trees nearby waterholes and streams. White-bellied Woodpecker (Hemicircus canente) are always found chipping down hard thick wood and many times high in the canopy. 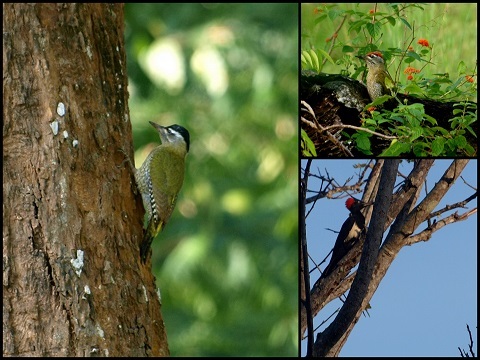 Woodpeckers are one of the major bird specie controlling insect population in our jungle. They are also called the ‘Doctors of the Jungle’. They spend their entire day in cleaning tree trunks and tree barks and keeping check on tree boring beetles and bugs. Doctors of the jungle work like a team to keep our wilderness healthy. They are the best natural pest controllers. It’s a wonderful experience to spend hours, patiently and get the perfect snap of these beautiful and creative birds. Their carpentry and nesting works are just beyond expressions. One of the best parts of InnTheWild, Mudumali is that you can just sit in the balcony of your rooms and spend hours observing these colorful, cheerful, creative birds. I truly look forward to introducing and educating you about their habitat and behavior patterns in person. So what are you waiting for, Experience being – InnTheWild.